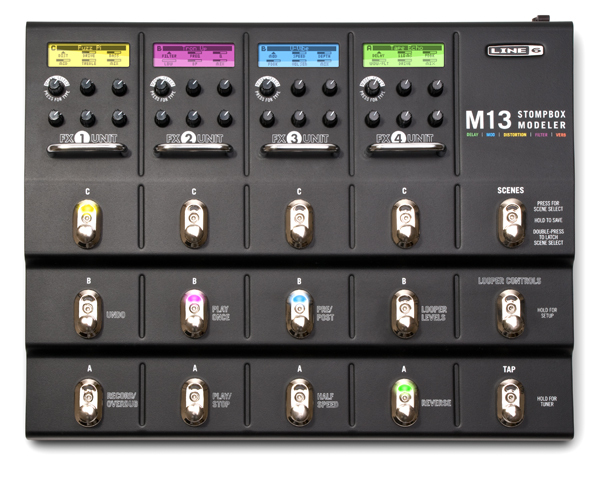 The Line6 M13 Stompbox Modeler is an all-in-one pedal board. It features a comprehensive collection of stompbox effects, plus a full-featured looper. It offers over 100 distortions, reverbs, delays and more, with up to four different (or the same!) effects. Stompbox-style knobs offer on-the-fly tweaking and you can set it to remember changes without “saving”, although some may prefer not to lose their great sounds with an ad-hoc tweak! You can order the effects any way you want, although spacial and reverb effects may be best towards the end of the chain. The effects are mostly spot-on, with several types of wah, uni-vibe, mutron and many other options. After 6 months with it, I’m still discovering new sounds combinations. Having chosen your three banks of 4 effects, that is saved as a “scene” and you can create 11 more scenes, offering 144 stompboxes. As if that weren’t enough you can have 4 different sets of 12 scenes, although this is far to much for a mere human to remember. So you can have a scene for your death metal band, another for acoustic gigs, one for sheer weirdness etc. Scenes can be backed up to your computer using the MIDI in/out, sadly no USB. Two sockets allow for real time modulation via foot pedals or switches. Setting these couldn’t be easier. With the volume pedal up, adjust the sound to suit. Press it down, readjust the settings and it’s done. Pressing the pedal will morph from one set of settings to the other. Using this to adjust delay time / level produces some superb effects. The 28-second looper is 2 stomps away at any time, with dedicated footswitches for Play/Stop, Half Speed, Reverse and Undo/Redo. The recorded loop can be placed before or after the onboard effects, so you can record with 4 effects, then process that loop with 4 different effects. Having recorded a loop, if you engage record again, you can overdub, with a switch allowing you to undo the most recent overdub. Pressing full/half speed during recording creates some great “octave” type effects. One of the external pedals (not supplied) can be used to control the feedback allowing you to fade loops out. Sadly, the loop is simply part of the output signal, it can’t be fed to a separate amp. The loop length cannot be synced via midi or anything else. All in all, brilliant fun. Some users have been obliged to replace foot-switches after a time, although this may be due to size 11 feet. The lack of activity from Line6 seems to imply that they are not working on a further development of this model (other than the cut down M9 and M6 options, which is a shame. It doesn’t replace my main looper (an EDP) but for dropping by to a gig and doing some on the fly looping, it’s brilliant. The manual is unbelievably short, considering how much the unit costs.